Project Concept, January 2015 Submission – Old Grace Housing Co-operative Ltd.
Below is an excerpt from the executive summary of our application to Manitoba Housing to develop housing at 189 Evanson. Please also find our building drawings by following this link. 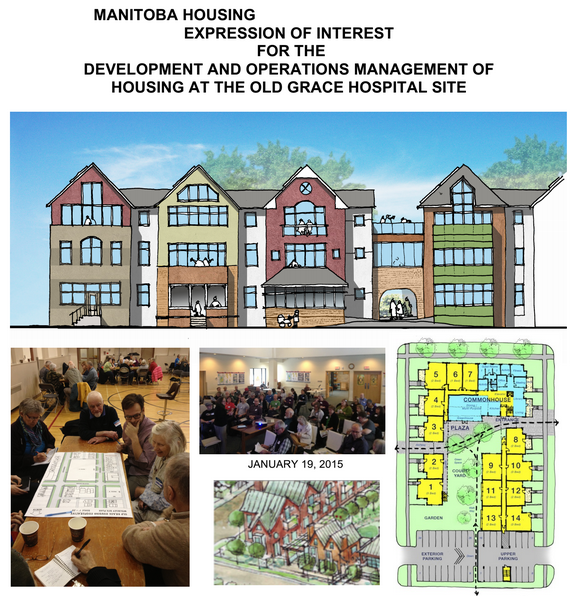 OGHC is a proposing an intergenerational, mixed-income, architecturally distinctive and sustainable co-operative housing project for this site – one that would be an asset to the unique neighbourhood of Wolseley and to the Manitoba co-operative movement. OGHC has an active, steadily increasing membership, currently approaching 90 members. Co-op members and leadership encompass a broad range of skills and experience in project and organizational management, fundraising, community and economic development, health care, education, social development, management, accounting, neighbourhood planning, labour, and volunteer leadership positions. Community consultation as development proceeded. To these elements, OGHC added the desire to integrate affordable and market housing within the framework of a non-profit housing co-operative, to reduce the impact of car usage for co-op residents, to achieve the greatest affordable degree of energy efficiency and sustainability, and to be a welcoming and accessible complex for individuals of varying physical and cognitive abilities. To realize this project concept OGHC has assembled an experienced and creative project team comprising DSI/ Tandem Consulting Resources, Prairie Architects, Inc, HTFC Planning & Design, and Transsolar Climate Engineers. The design team has led the OGHC group through a preliminary Collective Design Process and has been charged with continuing the project design using an Integrated Design Process. In addition, the design team has been directed to exceed provincial requirements for green buildings and to develop a highly sustainable, passive building complex. .OGHC also recognizes a responsibility to consider the impact to the local chimney swifts of the demolition of the old brick chimney stack which has served as nesting site for the swifts for several years. Chimney swifts are a Threatened Species in Manitoba and there may be ways for OGHC and partners to create an artificial nesting site at this location. The project is a mix of 1, 2 and 3 bedroom units in a 66-unit complex on the 2 sites. Half the units are designated Affordable (including 12 RGI units). It is proposed that all units be visitable and interchangeable between “affordable” and “market”. Eight (8) fully accessible units are planned. The parking, service and common areas and exterior landscape are all fully accessible. The design of the buildings and exterior areas reflects the character of the Wolseley neighbourhood and fits within the existing C-2 zoning classification. While OGHC members are committed to reducing reliance on private vehicles, we recognize that parking represents a significant concern to the immediate neighbours of the site. We have therefore proposed of 62 resident and visitor parking spots, with 2 car co-op vehicles. This number compares favourably with the 30-40 resident plus visitor parking spots the City of Winnipeg would require. The parking allocation includes 6 handicap spots, exceeding the City’s requirement. Should it be determined that the number of parking spaces could be reduced, OGHC would propose replacing them with additional apartments and/or green space. OGHC intends to develop a financially sound housing co-operative, providing housing of moderate size and cost to members with a variety of income levels. The projected capital budget is $15.1 million to be funded by mortgage financing (60%), member shares (20%) Manitoba Rental Housing Construction Tax Credit (5%), and Manitoba Housing (15%). The land would be leased at a modest rate. Manitoba Housing assistance could be structured in a number of ways, including grants, forgivable loans, or loan guarantees. OGHC hopes that long term financing for the project can be provided by a credit union. Our current financial model proposes Median Market Rents (MMR) for all units. In addition, member shares ranging between $10,000 and $105,000 (depending on unit size and ability to qualify for AHI or RGI housing) are projected. With limited funding available to housing co-operatives, OGHC recognizes that all members, including those qualifying for will need to provide much more substantial member shares than those moving into existing housing co-ops. OGHC recognizes that the required investment levels for the affordable units have the potential of excluding individuals and families with limited or no existing equity. Discussions with potential partnering agencies such as the Jubilee fund and the City of Winnipeg to help address that concern have been begun. All costs related to market units and their share of amenity areas are borne by market members. Members may be able to provide additional financial contributions to upgrade their individual unit (assuming compliance with OGHC and Manitoba Housing guidelines). Essential to the OGHC vision are well-designed interior (home styling) and exterior common (amenity) spaces, both for the use of co-op members and of potential benefit to the larger community as well. Our submission includes a total of 2310 square feet of common area/amenity space: 20 square feet for each affordable unit and 50 square feet for each market unit. This allocation reflects Manitoba Housing’s recent cap on the amount of amenity space it will subsidize. An additional common area allocation of 4390 square feet is included in the drawings (as presented to the membership on January 10, 2015). No costs or revenues for this additional space were included in the proposed budget. As with all projects, it is expected the design will continue to evolve as the project proceeds and the additional space could be allocated for any number of potential uses once funding and partnerships are firmed up — e.g. more apartments, more amenity space, day care, commercial space, etc – or reduced or eliminated. The commitment of the membership is evident from the fact that, as of January 15 2014, 36 members have currently provided share deposits of $500 each, and 46 households have expressed interest in an apartment in the complex within 5 years. Fewer than 30 would require parking. A recent member survey indicated that 42% of members would qualify for Affordable Housing and 58% for market housing. OGHC has obtained substantial support from neighbourhood organizations, local businesses and the not-for-profit sector. More than 25 letters of support have been received. This support results from OGHC’s significant efforts toward information provision and community consultation– meetings with resident groups, a series of articles in the community newspaper, invited participation in the first Collective Design Process workshop, the OGHC web site, etc. OGHC recognizes that a number of unknowns will have significant impact on project costs and member share costs. The most significant of these are the construction costs and the costs of project financing. OGHC is committed to careful monitoring of project costs to ensure as far as possible the realization of a successful project. Click here Botox treatments offered in Lexington, Kentucky a safe and quick treatment for wrinkles without any real downtime improvements. Don’t forget to check out our building drawings by following this link!